business of burlesque | Oh, The Glamourous Life! Keep track of your costs when creating a new act. I know it’s tedious, but record at least your cash outlay, like for costume supplies and studio rental. You should also track your time. It has value too.How long did you spend sewing, rehearsing, editing your music, &c. With this information, you’ll have a good idea of what your act is worth. You can then figure out how much you’ll need to charge and how many time you’ll need to perform the act to start making a profit on it. Happy Friday! Today’s tip comes to you verbatim from Mr. Scratch, who is so much better at the business side of burlesque than I’ll ever be. Even if you’re friendly competitors, every burlesque performer in your market is looking to reach the same people. You can learn by keeping an eye on their social media (Facebook, Twitter, Instagram, etc. and don’t forget to get on their email lists!). Your competitors may be offering a variety of services that you haven’t considered. Getting out of your bubble and examining what others are doing can help you be more successful. Read their websites for a list of services or performance elements that they offer. Read reviews of your competition on sites like Yelp or Goldstar to see if there is anything you could be doing differently. Reviews aren’t always criticism; often, people will mention their favorite parts of the show or the ways the producer went above and beyond to make the show special. Comments can tell you exactly what your potential clientele wants — and doesn’t want. When producers ask you for something (music, a photo, &c.), give them exactly what they ask for. If everyone involved in a show sends the producer what is requested, things will run more smoothly. If one person fails, it’s more work on the producer. If everyone ignores the specifications… it’s ugly. If the producer asks for your music as a file, send the music file. Don’t send a YouTube link or an iTunes Store link. If a file format is specified (like mp3 or wav), make sure you’re sending the right format. If the producer asks for a high-resolution photo, don’t send a web-resolution photo. If they’re printing promo material, a low-res photo isn’t going to look as good on paper as it does on a screen. Make sure it’s a 300dpi image. If the producer asks for a link to a video, post your video on YouTube or Vimeo and send them an unprotected link. It doesn’t have to be publicly listed, but it shouldn’t require a password. Don’t send them the video file. If the producer asks you to use a file sharing service, like Dropbox, don’t email the file. Huge files can completely overwhelm an inbox. If the producer asks you to send something to a different person, like the stage manager or sound tech, don’t send it to the producer. If you’re not a tech savvy person, ask for help, but not from the producer. The producer is busy enough producing the show and can’t also be your (or anyone else’s) tech support. If you do exactly as the producer requests, you’ll be seen as a professional who pays attention, follows directions, and makes the producer’s job that much easier. And people like that tend to be rehired. The flip side, for producers, is that you must be very clear in what you need, when you need it, and how you need it. Jo Weldon has a very informative class on how to deal with producers, festival organizers, and the press. Take it if you get the chance. 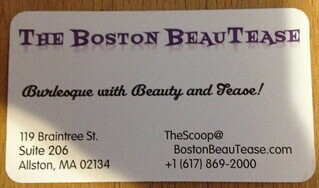 Recently we changed our name from The Boston Babydolls to The Boston BeauTease. This has necessitated all sorts of other changes: email, social media, &c. and of course, business cards. You might recall that several years ago Scratch gave us these fabulous personalized business cards, which now have the wrong information on them. I just love these cartoons of us! One of the great things about events like BurlyCon and The Expo is that my stock of tips gets replenished! This week’s tip comes via Siren Santina and her class on merch. Take credit/debit cards at your merch table. Now I’m a cold hard cash sort of gal, but so many people rely on the magic plastic these days. You don’t want to miss out on a sale! It’s gotten very easy to accept cards these days, you just need a card reader and a smart phone. Lots of places offer CC services (Square, PayPal, Amazon, &c. I just heard Etsy got in on the racket). Do your research and find one whose terms & fees work for you. At B.A.B.E. we use Square, which Brigitte just loves*. Set a minimum price for using cards, because the processors do take their cut. That way you don’t lose all your profit to fees on a small item and if the patron really wants that item which is under your minimum, they’ll end up buying more. * She loves the selling part. I don’t think she cares what happens after she swipes that card. Happy Friday! Here’s your tip. Stage names are not necessarily the same as Facebook handles. Confirm the correct name before using in publicity or press. Kitt En de Ville: actually Kitten de Ville — why FB thinks that “Kitt En” is more of a “real” name than “Kitten” is beyond me. Stevi Sailor St Claire: Sailor St. Claire — FB suspended her account until she used her “real name”. “Stevi” isn’t any more “real” than “Sailor”. Alegsandra Malone: Legs Malone — I think this one is a particularly nice dodge. Mizter Scratch: it’s just “Scratch”, but FB won’t let you have a one-word name and they don’t allow “Mister” or “Mr.” as a name, but apparently “Mizter” is legit. Always confirm the preferred spelling, spacing, punctuation, and capitalization with the performer her/himself or by checking their website (of course they have a non-Facebook website; they read that tip). P.S. In case you were wondering, it’s “The Boston Babydolls”, not “Boston Baby Dolls”. Happy Friday! Time for a tip! This piece of advice comes from Mr. Scratch, from whom I have learned many valuable things about business and communication. You should always send thank you notes — to a producer who booked you, to a photographer who shot you, &c. — and obviously a quick email serves that purpose. However, people are always delighted to received an actual something in the mail; it so rarely happens these days. And it shows you took the time and care to hand-write a note, address it, stamp it, and mail it. Plus, most people don’t want to toss something like that in the trash, so your note will linger, reminding them of you. It’s also a great excuse to have a library of appropriate stationary and cards. 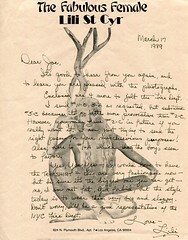 Just look at Lili St. Cyr’s personalized stationary! If you had letterhead like this, wouldn’t you want to send letters? Vote for The Boston Babydolls for “Best Theatre Group” and B.A.B.E. for “Best Dance Classes“! Buy your tickets to The Teaseday Club on July 9th in my name! Have a website. A FaceBook Page doesn’t count. There are a number of easy-to-use, free or cheap services out there. Personally, I use Bandzoogle, Doteasy, and WordPress. I am very much not a tech person, so if I can do it, so can you! Have business cards. And always carry them. I like cards printed on uncoated stock, so one can scrawl a note on the back. A lovely thing about cards is that they require you to have a business card case, and there are many wonderful designs out there. Personally, I keep mine in a German cigarette case. If someone contacts you about a gig, get back to them in a timely fashion. If you don’t want the work, say so (politely, of course). It’s rude to leave someone hanging.